Renault and Schneider had been long time providers in the French tank industry. Hotchkiss (Société Anonyme des Anciens Etablissements Hotchkiss et Cie), founded in 1875 near St Denis (Paris) by Benjamin B. Hotchkiss, an American engineer, was a newcomer in this field, although already well known by the army for its world-famous machine-guns, cars and transmissions (like the Hotchkiss drive). 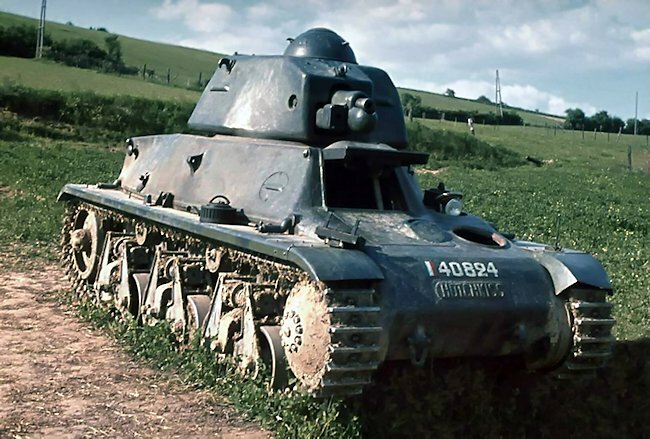 At first, the Hotchkiss H35 was a private design answering a 1926 specification for a light, cheap infantry tank, or Char d’accompagnement. A proposal was ready by June 1933 showing some innovations, like entirely cast steel hull sections. It was also theoretically cheaper and lighter than the former Renault D2 and was initially retained by the army’s Conseil Consultatif de l’Armement. The final specification issued on the 2nd of August 1933 asked for a 6-ton tank, uniformly protected by 30 mm (1.18 in) of armor. Hotchkiss was not the only bidder in this field. Renault quickly entered the fray, being the first to deliver its prototype, which would be accepted as the R35. 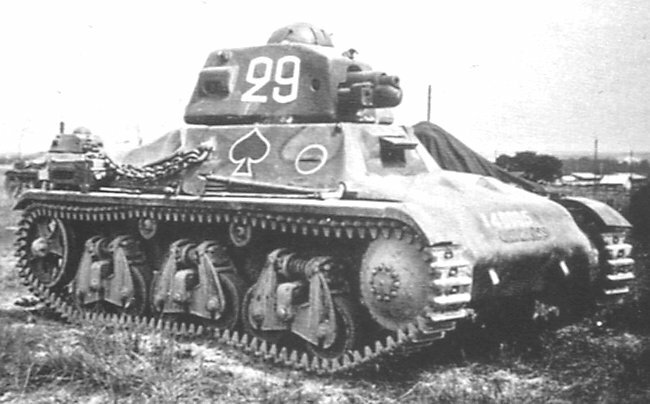 However, the first prototype Hotchkiss showed to col. Keller of the Commission of Vincennes, was a machine-gun armed tankette, tested until March 1935, and followed by another identical vehicle, in May. 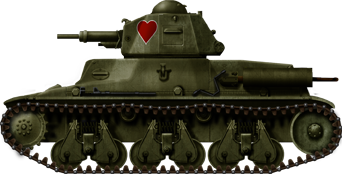 Both were rejected because the initial specification was changed in the meantime, now asking for 40 mm (1.57 in) armor. In August 1935, a third and last prototype was delivered, with a brand new cast hull and APX-R (Puteaux) cast turret armed with a 37 mm (1.46 in) short barrel gun. The proposition was accepted in November as the Hotchkiss H35 and followed by an order of 200 machines. Production started mid-1936 and by September the first series H35s were delivered and heavily tested. However, it appeared that their cross-country capabilities had been overestimated. They had bad balance and quite bumpy ride, which was potentially dangerous in formation, particularly when firing on the move. The power-to-weight ratio performance was also insufficient. Therefore, the Army turned them down. But as the initial order could not be cancelled from fear of a political upheaval, the Cavalry, already interested because of the slow deliveries of the costly SOMUA S35, accepted to take them instead. 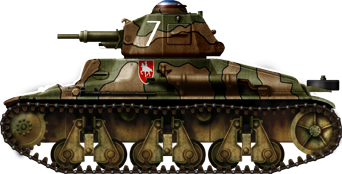 The initial H35 was a small and narrow machine, in order to fulfill the bid and keep the weight in check, while having one of the thickest armor of any light tank of 1935. The H35 was very similar to the Renault R35, its main competitor. They shared the same APX-R (Puteaux foundry) single-piece cast turret characterized by sloped sides, rounded bottom and a spherical vision cupola. The cupola comprised a PPL RX 180 P optical visor and targeting sight. Just behind the mantlet there were three Chrétien binocular slide projectors (later horizontal PPL vision slits). The turret, which weighed 1350 kg with full equipment, housed a low-velocity SA 18 gun M37 (87 kg), with a coaxial 7.5 mm (0.295 in) Reibel machine-gun M31, protected by a small additional mantlet. The main gun received 102 rounds, and the machine-gun 2400 rounds. The SA 18 had a +20 -13° elevation. The hull was rather small, completely built of cast parts welded together, only 4.22 m (13.78 ft) long and narrow, at just 1.95 m (6.4). The total weight, in battle order, was a mere 9.6 tons. The tracks were small too, each link was only 27 cm (10.63 in) wide. The smaller links procured a smoother ride. The commander had a small seat and strap, but was standing for observation and operating his weapons. The suspension was made of six pincer bogies, each holding two rubberized roadwheels, sprung by helicoidal horizontal springs. There was a front drive sprocket, a rear idler wheel and two return rollers on each side. The driver/mechanic sat on the right side, seeing through a periscope mounted on a hinged flap, supplemented by two oblique vision slits on the sides. A door section of the hood opened forward to allow the driver access. The commander/gunner accessed the turret through a rear door, and there was an extra emergency manhole at the hull bottom, just behind the driver. Equipment and tools were situated around the hull, comprising a camouflaged tarp fastened by straps to the back, a shovel, hatchet and cutter, on the left fender, a pickaxe bracket at the left of the hull, a mass, jack and crank on the right fender, a track cleaner on the rear cover, a 10-ton cable at the rear and two towing steel chains attached to the hull rear panel. The engine hood was plunging forward, protecting a gasoline, air-cooled, Hotchkiss 3.4 liters, 6 cylinder, developing 75 hp@2400 rpm, for a 8.8 hp/ton ratio. The gearbox was synchromesh, 5 speed forward and one reverse. Normal consumption was 130 liters/100 km. The normal speed on road and flat terrain was 28 km/h, ground pressure was 0.9 kg/cm2. The H35 was found capable of climbing a 35° slope, a 70 cm high obstacle and ford a 0.85 m deep river. However, trench crossing was limited to 1.80 m.
The initial order was followed by the first delivery in September 1936. Production was interrupted after 400 had been built, in late 1937. Hotchkiss was summoned to revise the design, which will become the H39. The Hotchkiss H35 initially equipped several cavalry units, the 1st DLM (Division Légère Mécanique), 18th Dragons, 4th Cuirassiers, the 2nd DLM and 3rd DLM; the first light cavalry division (1er Régiment d’Auto-Mitrailleuses & Escadron de Reconnaissance Divisionnaire), 2nd and 3rd D.C.L. 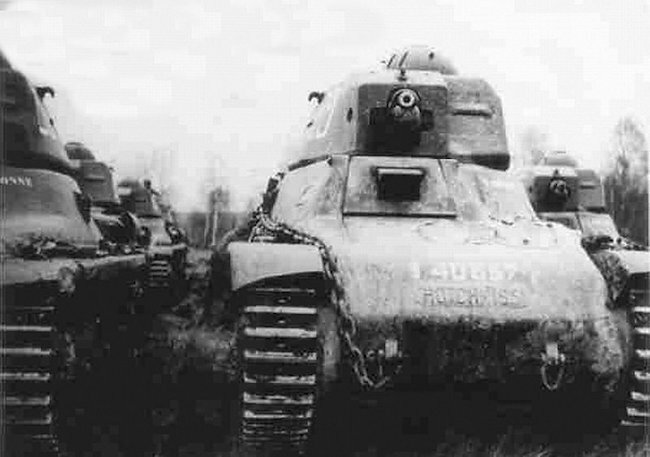 Later on, as the R35 deliveries were not sufficient, part of the production of the H35 was diverted to the infantry. It was given to the 13th and 38th BCC (Bataillons de Chars de Combat) of CMC 515, the 33th B.C.C., 22nd and 24th B.C.C. from C.M.C. 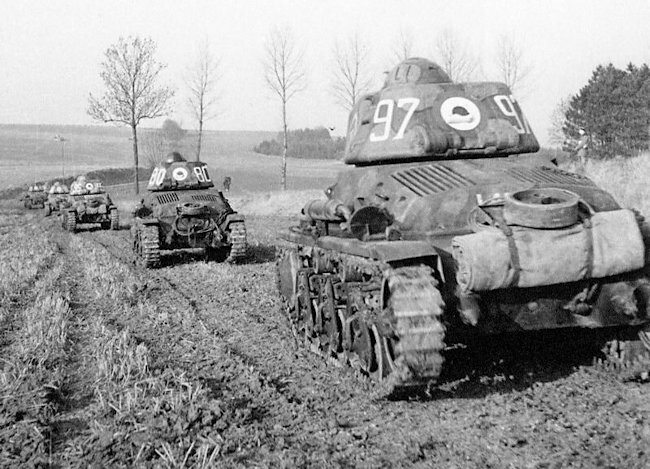 510 based at Nancy and Lunéville, as well as the 342nd and 351st CAC (Compagnie Autonome de Chars – Autonomous Tank Companies) from the 1st “Division Cuirassée” (D.C.R.) of general Bruneau. All took part in the operations of May-June 1940, but performed poorly because of their limited speed, endurance and low-velocity main gun. However, the German infantry, largely equipped with the PaK 36 37 mm (1.46 in) gun, was baffled to see how their rounds simply bounced off the thick armor of these light tanks. The H39 was an overhaul of the previous model, with a new Hotchkiss 6-cyl. 5.97 liters engine giving 120 hp at 2800 rpm. With a power-to-weight ratio of 10 hp/ton (the weight rose to 12.1 tons), top speed was now 36.5 km/h (22.6 mph) on road and range increased to 150 km (93 km) thanks to a new gasoline 207 liter tank. The new engine imposed a redesigned hood, the rear being raised and now nearly horizontal. Apart from these details, the H39 was very similar to the previous H35, with the same SA 18 short barrel gun. But it was also subjected to some criticism and, by the end of 1938, proposals were made to adopt the new SA 38, long barreled 37 mm (1.46 in) gun, which had far superior penetration power and muzzle velocity. The turret was now equipped only with the new PPL horizontal vision slits. The SA 38 was supplied with longer rounds, and thus only 90 could be carried (instead of 100 with the SA 18). The gun was in relatively short supply, and despite the priority given to production of this new weapon, many H39s were put in service with the older gun model. 700 H39s were built in total, starting in October 1938, the last being delivered in feverish conditions, thrown in combat right at the factory door in May 1940 without exhaust or mudguards. In early 1939, Hotchkiss’ delivery rate was around 60 units each month. Final records are confusing, and based on the chassis numbers and factory monthly deliveries by 1940, the usual figure is 1200 machines in total, for both subtypes. The Hotchkiss H39 was also given to cavalry units. The 3rd D.L.M. (Division Légère Motorisée), 4th and 5th DCL, and Army units like the 25th and 26th DCC of Maubeuge, the 2nd DCR and the 3rd DCR. Another unit, the 342nd CACC, had a rich history starting with the expeditionary force in Norway. Fifteen H39s were shipped to Narvik on the 7th of May. 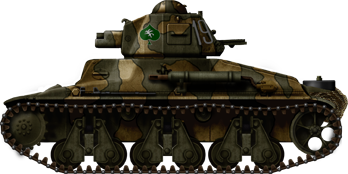 Only 12 were withdrawn in June and finally disembarked in Great Britain, where they would form an embryo of the armored forces of the FFL (Forces Françaises Libres), the Free French led by De Gaulle, as the 1e Compagnie de Chars de Combat de la France Libre. They will see action during the battle of Gabon and in Syria, some being opposed to other loyalist Vichy-manned Hotchkiss H35/39. Operational formations were unfortunately mismatched. The slow H35s operated with the fast SOMUA S35, and the H39 with the B1 bis. During the May-June campaign, the H35 and H39 found themselves committed in spread out formations and rarely had a clear superiority over the enemy. 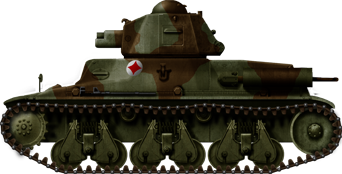 Their 37 mm (1.46 in) “long” model 38 gun was, added to their thick armor, a clear advantage in tank-to-tank engagements against German light tanks. 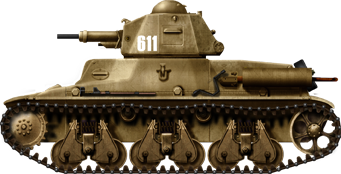 They were matched only by the Czech-built Pz.Kpfw.38(t). However, tactically, the lack of radio and communication with HQ, as well as the overburdened tank commander led to disastrous results. 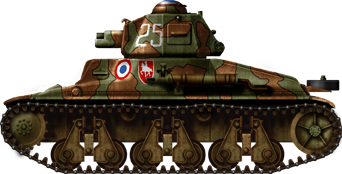 Hotchkiss H39 tanks livery was normally drab compared with the pre WW2 H35 tanks. Many were abandoned due to the lack of gasoline, entire units being later captured in this way. Some participated in a few improvised counter-offensives directed against the German “Ghost Division”, without air support, which had dire consequences. After the capitulation, the Vichy regime was allowed to send some reserve units in its colonial areas, North Africa (27 of the 1st Régiment de Chasseurs d’Afrique, which fought against Allied M3 Stuarts during operation Torch, destroying three of these), and also in Syria. Many H35/39s saw action under foreign colors. Three H35s were sent in July 1939 (as well as three R35s) to the Polish Bureau of Technical Studies of Armored Weapons for trials. In September, integrated in an ad hoc unit commanded by Lieutenant J. Jakubowicz, they fought hopelessly with the Dubrno task force. Two were also sold to Turkey by February 1940. Many more saw service with the Axis. 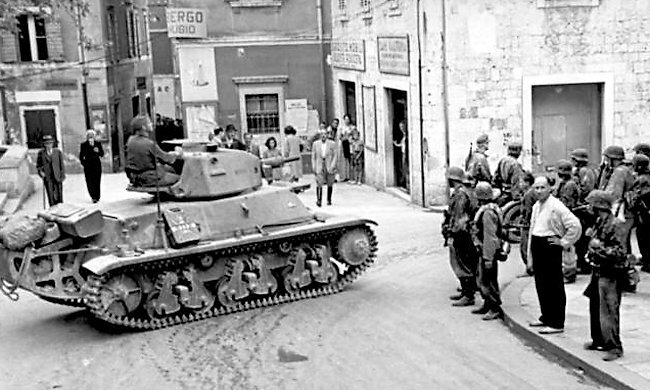 Hotchkiss H39 Tank being used for Policing duties in occupied Yugoslavia. After the capitulation, the Germans seized an impressive lot of French R35/40s and H35/39s in generally good condition. 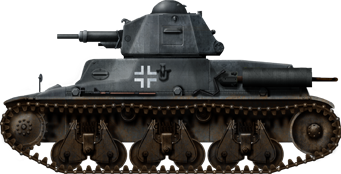 Around 550 H35 and modifié 39 models were taken over by the Waffenamt, and many modified, their original cupola being replaced by a two-hatch model. They were distributed among several independent companies, as the Panzerkampfwagen 35H 734(f) and Pz.Kpfw. 38H 735(f). Most were kept unchanged, painted in the regular Dunkelgrau livery for police and occupation duties in France. Many others saw service abroad, like the 211e Panzerabteilung in Finland for the upcoming Operation Barbarossa. 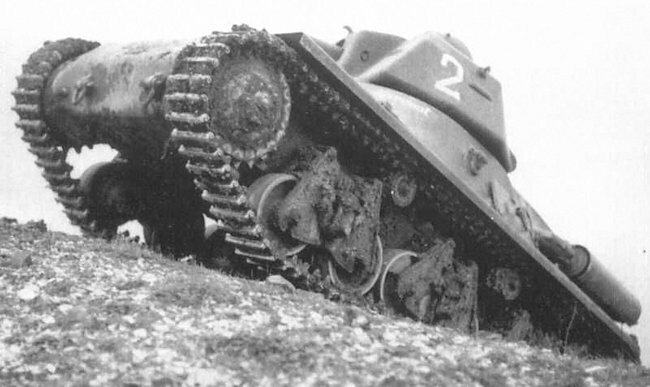 By 1942, they were joined by three mixed units, Panzerkampfwagenzüge 217, 218 and 219, makeshift tank platoons comprising one SOMUA S35 and four H39 each. They were disbanded later. Three units, also comprising many H35/39s, were sent in Yugoslavia, like the 7.SS-Freiwilligen-Gebirgs-Division “Prinz Eugen”. 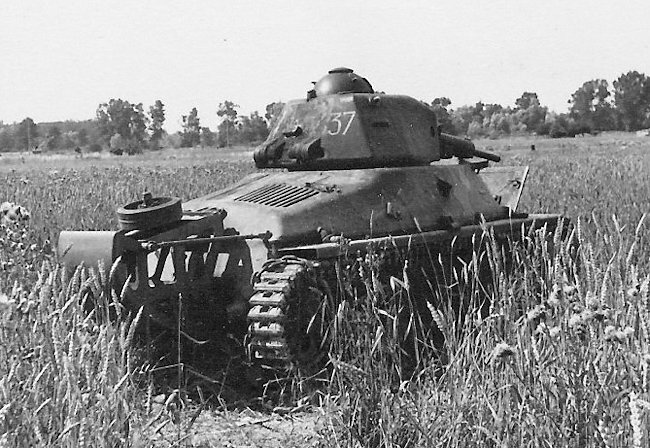 They became a familiar sight for the Partisans, and the most current tank used by Chetnik crews. Artillerieschlepper 38H(f): Ammunition carriers, supply tanks and artillery tractors, without turrets. 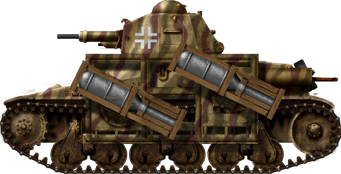 Panzerkampfwagen 35H(f) mit 28/32 cm Wurfrahmen: Ad hoc conversions as rocket launcher mobile platforms, featuring two large frameworks with two heavy rockets each. 7,5 cm PaK40(Sf) auf Geschützwagen 39H(f): 24 units were converted as Marder I tank destroyers in 1942. 10,5 cm leFH18(Sf) auf Geschützwagen 39H(f): 48 units converted to a self-propelled artillery version. Very similar to the tank destroyer version, sharing the same high armored casemate. Panzerbeobachtungswagen 38H (f): A 1943 special conversion as an artillery observation vehicle. 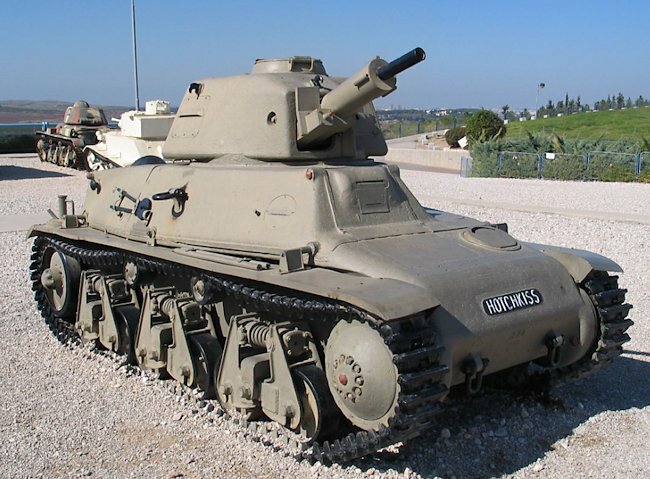 The last appearance of a Hotchkiss tank on a battlefield occurred when ten H39s were sold to the Israeli clandestinely and shipped from Marseille to Haifa in 1948. They took part in the 1948 War of Independence with more modern guns, and perhaps the Sinaï campaign in 1956 (as it is claimed by some sources). One is still standing at the Yad la-Shiryon Museum (Latrun). 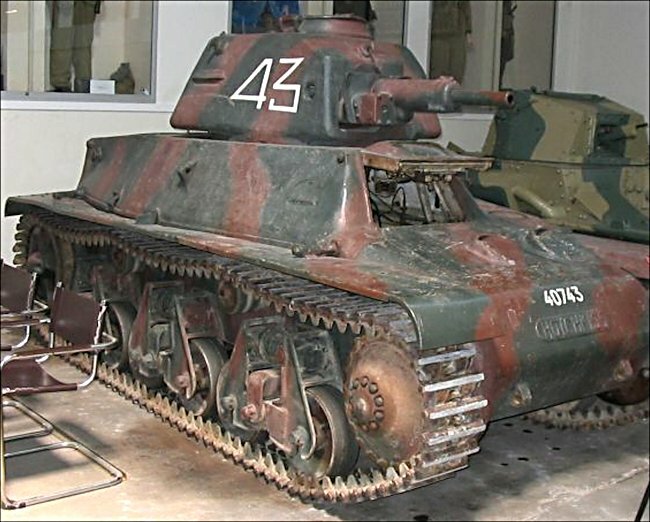 Two are still in existence in Norway, one in Serbia, another in Bulgaria, three in France (notably at Mourmelon-le-Grand ), including one in full running condition at Saumur, one in Britain at the Kevin Wheatcroft Collection and one in Russia, at the Kubinka Museum, captured from the 211th Panzerabteilung in the summer of 1944. 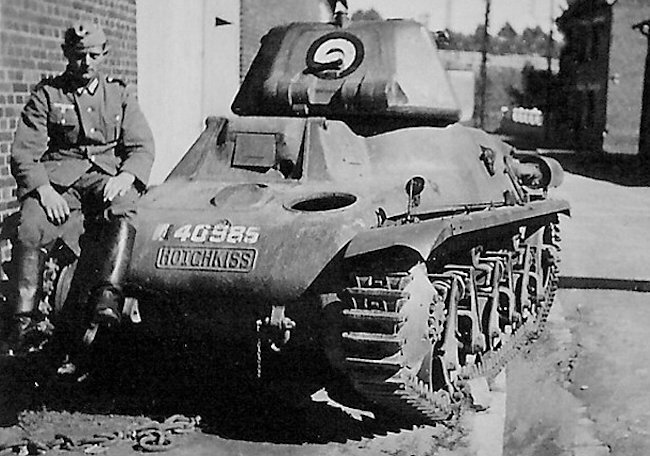 Hotchkiss H35, 4th Cuirassiers of the 1st DLM, “Joan of Arc” regiment, Belgium, May 1940. 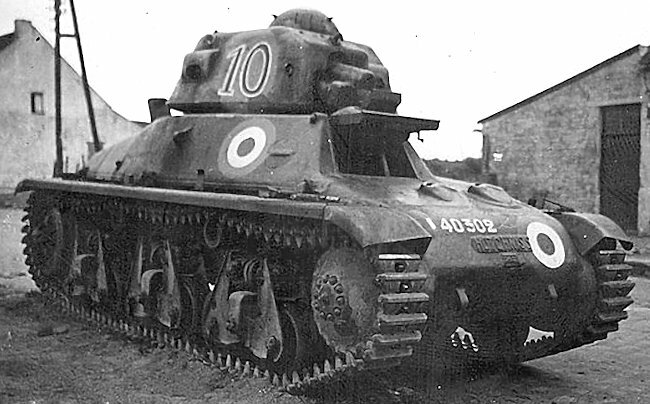 Hotchkiss H35, 18th Dragoons, 1st DLM (Division Légère Motorisée), Montcornet, May 1940. Hotchkiss H35 modifié 38, upgunned with the SA 38 long 37 mm (1.46 in). 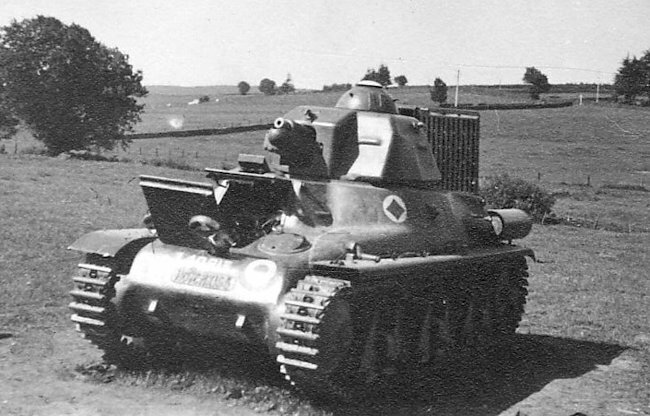 Hotchkiss H35 mod 38 command tank version, with a steering tail, 29th Dragoons, 2nd DLM, France, May 1940. Hotchkiss H39, early type (SA-18 gun version), 4th DLC, 4th RAM, third squadron, third platoon. Hotchkiss H39, mid-production, (SA-38 gun version), 1st DCR, 26th BCC, Northern France, May 1940. 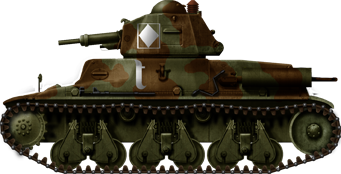 Infantry versions were generally camouflaged in a simpler two-tone pattern of brown patches on factory olive green. 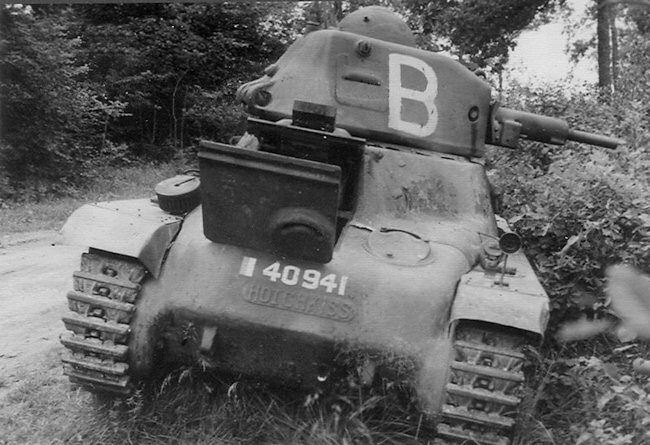 This example was fitted with a turret radio. Hotchkiss H39, 1st DCR (Division Cuirassée), 25th BCC. This unit was attached to the 26th BCC and photos show mixed types with both SA 18 and 38 guns. Some, from the late production batches (April-May 1940) were not camouflaged, like this one. Panzerkampfwagen 35H 734(f) in France, 1942. Panzerkampfwagen 38H 734(f), France, 1944. These tanks were mostly used for anti-partisan warfare. Panzerkampfwagen 35H(f) mitb28/32cm Wurfrahmen, Normandy, summer 1944. Panzerjager auf GW39H(f) Marder I tank hunter, Normandy, summer 1944. 10,5cm leFH18(Sf) auf Geschützwagen 39H(f), 155th Panzerartillerie-Regiment, 21st Panzerdivision, Normandy, summer 1944. Sources and influences : Trackstory n°6 www.minitracks.fr, GBM. 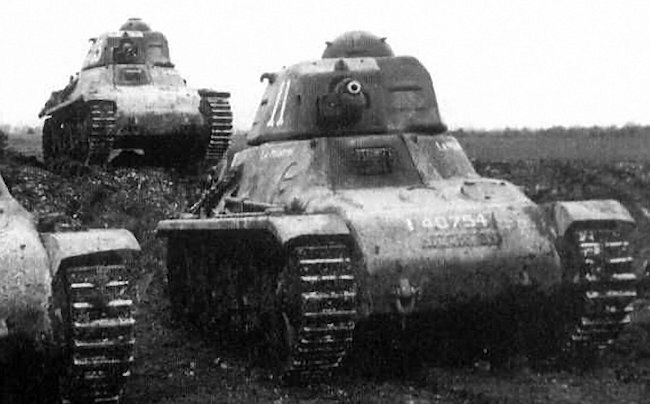 A troop of French Army Hotchkiss H35 tanks on patrol. 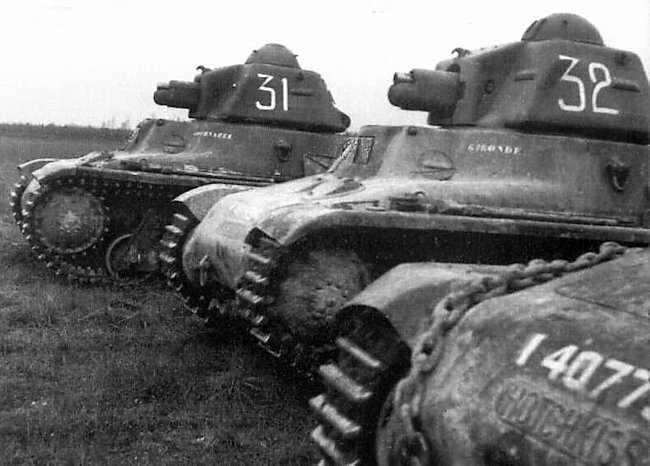 Mirielle Nicoud, quoting the masters thesis “Le Premier Regiment Etranger de Cavalerie en Indochine” by H. Yvanoff, notes that the 1st Foreign Cavalry REgiment received five H39 Tanks in 1947 for use by the “Groupe Escadron Cochinchine”, which was composed of the 1st and 2nd Squadrons. This per p. 112 of her own thesis “L’Emploi de la Legion Etranger en indochine, 1945-1955” Volume 1. The G.E.C. also received a shipment of motorcycles, light trucks, and armored jeeps.